Monday Musings: How to Get More Comments on Instagram? If you’re not a total Instagram addict like me, you might go a day or two without checking your app. And when you check your feed, you might notice that some posts from friends were shared mere minutes ago, while others might be a few days old. So, what gives? Why isn’t your Instagram feed chronological anymore? 1) Make your account public. Make sure new followers can find your content by opening your account. 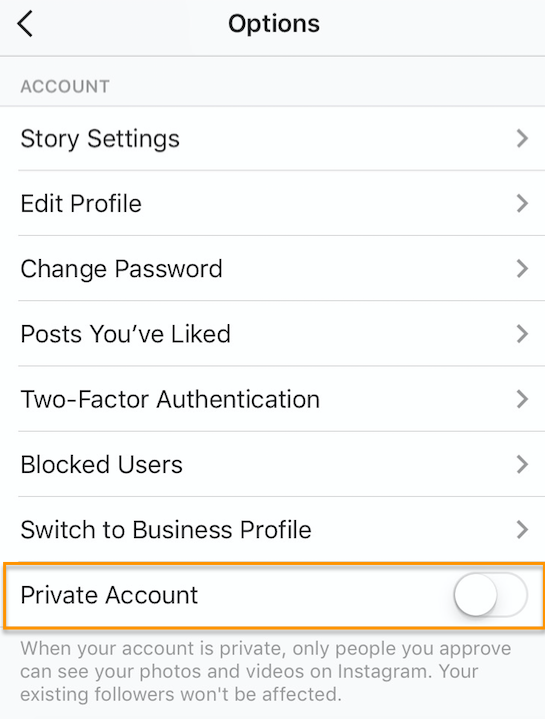 Navigate to your profile, tap the Settings gear icon in the upper right-hand corner, and toggle the Private Account button to the Off position. 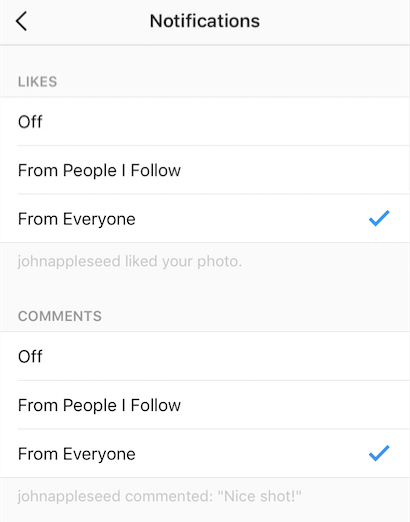 Turn on push notifications so you can quickly reply to or like your followers’ comments. Remember, the more users interact with your account, the higher on their feeds your content will appear. 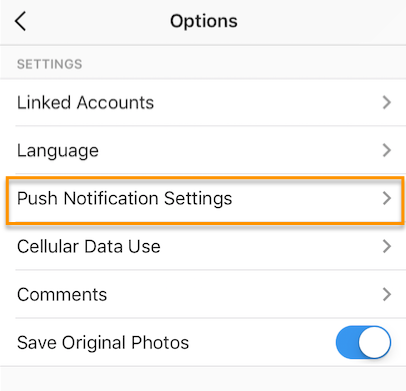 Navigate to your profile, tap the Settings gear icon in the upper right-hand corner, tap Push Notification Settings, and choose which Instagram actions you want to be notified for. People aren’t going to comment on uninteresting content, so enlist one team member to manage the scheduling and editing of Instagram content, but open it up to a larger team to source different photos, videos, and ideas to keep your Instagram feed fresh and interesting. 4) Develop an Instagram editorial calendar. Figure out an Instagram publishing cadence that works for you — and we recommend posting no more than once per day. Remember, timing is a factor in the algorithm, so you don’t want posts from earlier in the day to get lost in the shuffle. Download our social media content calendar to keep track of what you’re posting across other social platforms so you’re not repetitive and you’re covering all of your bases. Now that we’re all on the same page, let’s dive into strategies for getting more comments (and likes) on Instagram. 1) Host a giveaway or contest. A fun and easy way to get followers to comment on your Instagram posts is by hosting an Instagram contest or giveaway. You could post on Instagram promoting the contest, then ask users to enter by commenting on your post. You could make your contest a weeklong campaign, where users have to comment each day. You could even incorporate user-generated content (UGC) and ask followers to post their own photos and to tag/mention your brand in the post. 2) Host an Instagram takeover. Instagram takeovers are a fun way to get fresh content on your Instagram and to work with colleagues and influencers. They’re a smart way to generate more Instagram engagement, too. These takeovers help generate more Instagram comments whether it takes place on your account or you’re taking over another account. 3) Ask users to engage in the comments. A simple way to get more Instagram comments is to ask for them. Post content on Instagram that lends itself to sharing, and ask users to answer a question or tag their friends and coworkers in the comments. It’s a fun and easy way to interact with your audience, and it helps you garner more comments, too. 4) Post something funny, surprising, or provocative. In a study of what makes content go viral, research revealed some of the most viral internet moments also provoked high-arousal emotions. Among the most common were posts that created anticipation, surprised the viewer, and provoked curiosity and uncertainty. Emotions that incited feelings of joy were also among the most common, so think about content you could share on Instagram that makes people feel an emotion so strongly that they’re compelled to comment on it. Is there content you could post about a surprising fact, a happy moment, or an intriguing industry trend? It doesn’t need to be specifically about your brand, either — content that’s enjoyable for a broad audience will likely attract more comments. Time spent viewing videos on Instagram increased 40% in 2016, and now, users can post videos up to one minute in length. Post this engaging content to get followers to stop scrolling through their busy Instagram feeds and watch your video — and make sure it’s intruiging. Your audience wants more video content — especially on social media — so if you share something compelling and ask viewers to comment on it in the caption, they’ll most likely do it. When you post your content with relevant, popular Instagram hashtags, your posts appear in searches for those hashtags and the Explore tab. In fact, posts with at least one hashtag typically attain more than 12% more engagement. Influencers and interested users might organically comment when they see you talking about topics they’re also interested in, or you could combine some of the strategies above to generate engagement. 7) Publish at the right time of day. There’s a lot of debate over the best time of day to post on social media, and that’s because the answer varies depending on your industry, your followers, and what type of content you’re posting. Our best advice is to test out your engagement rates on Instagram when you post at different times throughout the week, and determine your publishing schedule based on the results. Whether it’s bright and early on Monday morning or later in the afternoon, try to figure out the time when your followers are more willing to stop and leave a comment to maximize the engagement of your posts each day. Use a social media content calendar to track scheduling and results. 8) Post photos of people’s faces. Let’s face it — selfies are fun. And as it turns out, they’re good for your Instagram strategy, too. An analysis of more than 1 million Instagram posts by Georgia Institute of Technology and Yahoo Labs found that posts with human faces are 32% more likely to attract comments — and 38% more likely to garner likes. There isn’t a ton of insight into why this is, but the researchers suspected that it’s partly because faces are effective sources of nonverbal communication that people respond to — even as infants. 9) Post photos of animals. There isn’t a lot of research to back this one up, but you know as well as I do that animals on social media are powerful. Animals have been popular on the web for a long time, and animal influencers can earn just as much money as human influencers on Instagram, Whether you have animals in your office or a cute picture of a coworker’s pet, try posting lighter, fun content on Instagram accompanied by a furry friend to see if your audience likes commenting on animals, too. Likes, comments, and video views are valuable on Instagram because they influence where your posts sit in the feed. Additionally, your content will be discoverable on the Explore tab if a lot of users interact with your posts — so test out these methods for attracting more responses on Instagram. For more ideas, check out our guide to Instagram for business. What are your strategies for getting more comments on Instagram? Share with us in the comments below.